I have to admit to a fondness for split pea soup out of a can – that log of sludge, which slides out with a squishy sound. It actually makes a smooth and comforting soup. But the thing about split peas is that they don’t need to be thick and stodgy. They can be almost delicate, but still with that reassuring distinctive flavor. 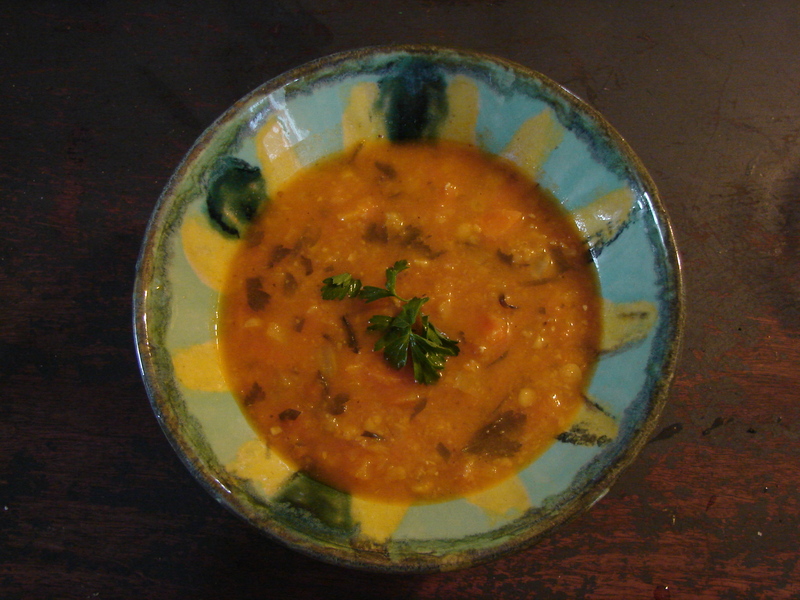 This soup combines yellow split peas with carrots (so many from the CSA!!) and a version of fines herbes. These herbs are FINE! Well, not quite. I used scallions instead of chives. And I used dried chervil because I couldn’t find fresh. It’s a light flavorful soup, with a nice amber broth. And here’s a version of Burning Spear’s Foggy Road, to remind you that this soup is not so thick you’d name a fog after it. Put the split peas in a pot with enough water to cover. Bring to a boil, leave for 3 minutes, and then turn the heat off and let them sit for a few hours. Warm the oil in a large saucepan. Add the garlic. When it starts to brown, add the carrots, fennel, chives, tomato paste. Stir till they’re warm through and the pan starts to dry out. Add the apple cider, and scrape the bottom of the pot. Drain the split peas and add them to the pot. Add water to cover by an inch or two. Bring to a boil, then reduce heat and simmer until the peas are soft, but still have a bit of texture. Add the butter and a dash of lemon juice, and a teaspoon of salt. At this point you can purée as much of the soup as you like. I like to do half, so it’s got a variety of textures. Return it to the pot, add the tarragon, parsley and chervil. Stir till it’s warmed through again, and the flavors are all mingled. Add salt and plenty of freshly ground pepper to taste, and serve! This entry was posted in beans, recipe, soup and tagged carrot soup, fines herbes soup, yellow split peas by Claire. Bookmark the permalink.